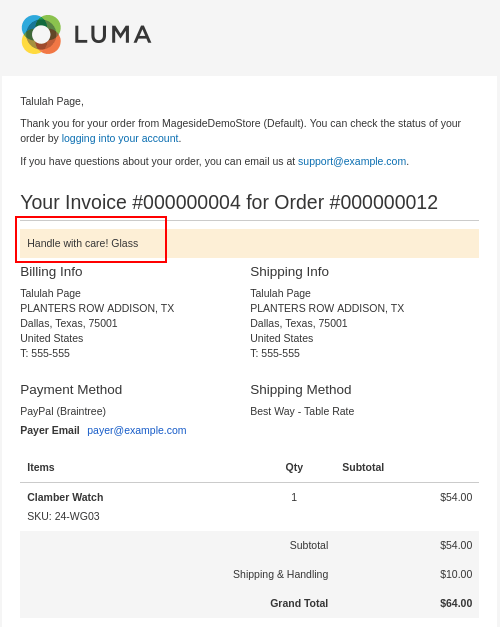 Magento 2 Blog - Mageside - How to send invoices in Magento 2? 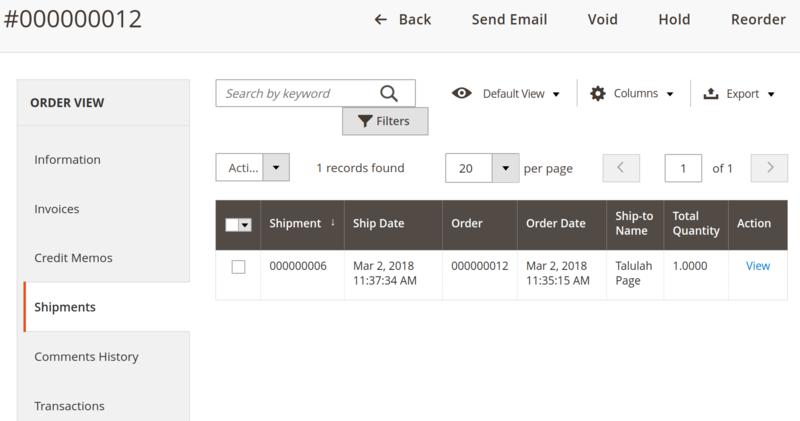 When you use Magento processing orders and engage in online sales, it is always likely that you will encounter documents like the invoice. The first thing you should have in mind about invoices is that they are definitely not identical with the receipts. A difference that is most obvious is the time of issue. Invoices usually sent off before paying. As a matter of fact, their main purpose is to request it from the buyer. In turn, receipts are given by the seller as soon as the payment is made by the buyer. By sending the invoice you as a seller report to your customer the necessary information. The content of the invoice, in particular, is certain information that tells when and how much he needs to pay you. Also, it may include an invoice number, quantity, the price for the unit, taxes, amount of the total due, date, and discount if exists. You need to sent invoices manually from the backend only in case if your customer used a kind of payment in which payment method is established as “authorization”. In payment method established as “authorization and capture” the invoices are always automatically sent. 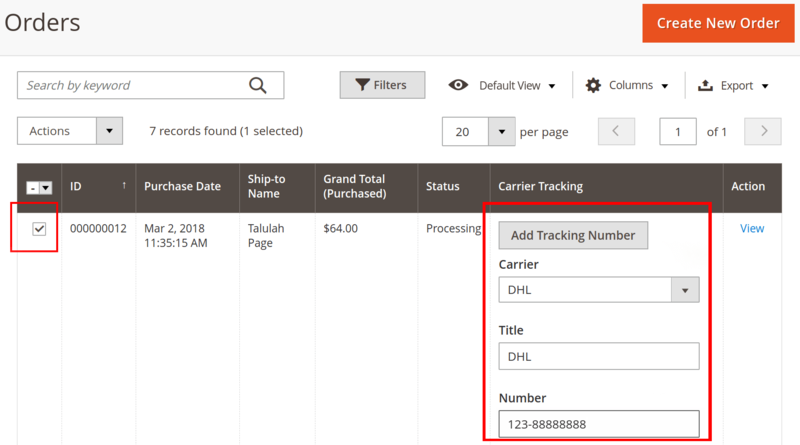 To generate a combination of tracking number, invoice and shipment you need to select a necessary orders in the order grid and tick on the corresponding checkboxes of the necessary orders. Also, select in a dropdown list the Carrier and fill in Title and Number boxes. In the Shipments section, you'll can find a created shipment. 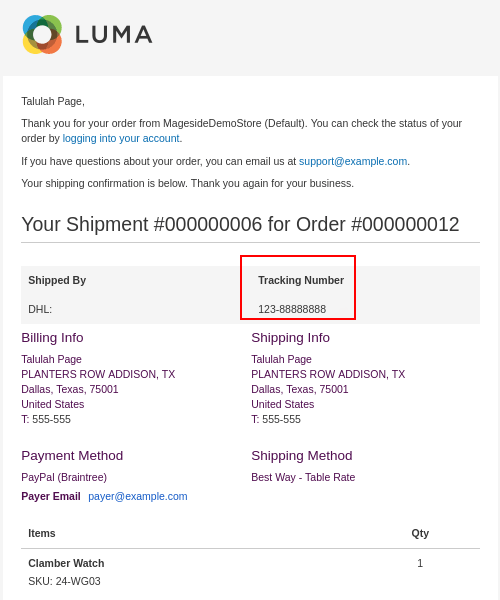 When the buyer places an order, the Magento store automatically sends the “Order confirmation” email. 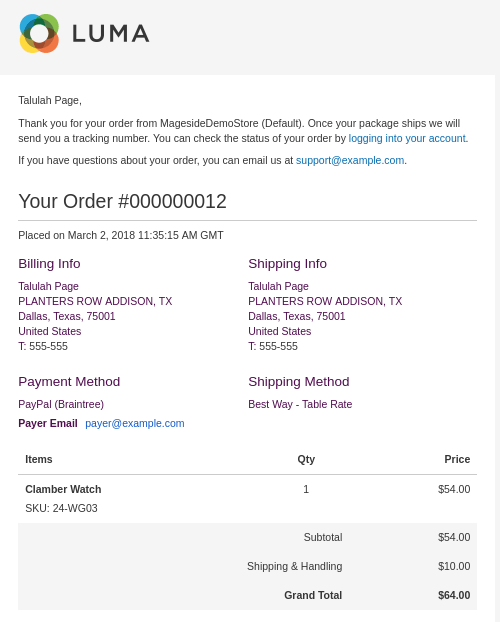 In the next example, Talulah Page placed an order and has got the email “Order confirmation” with her order number #000000013 on her email box. To generate a combination of the tracking number and invoice, you need to select a necessary orders in the order grid and tick the necessary checkboxes corresponding to the orders. Also, select in a dropdown list the Carrier and fill in Title and Number boxes. 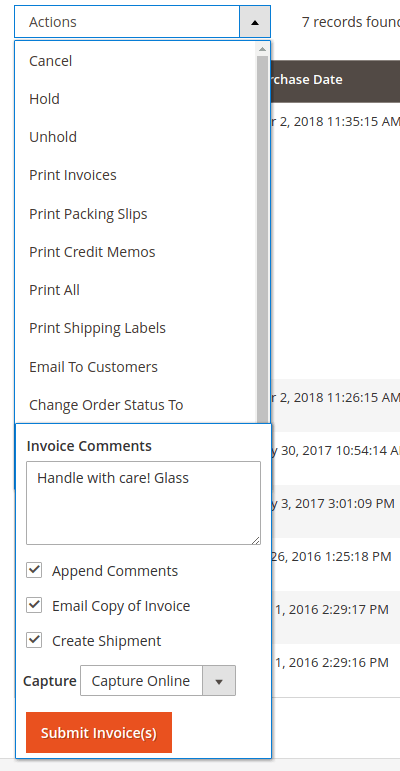 The step that follows is for you to select the Invoice in the Actions dropdown list. 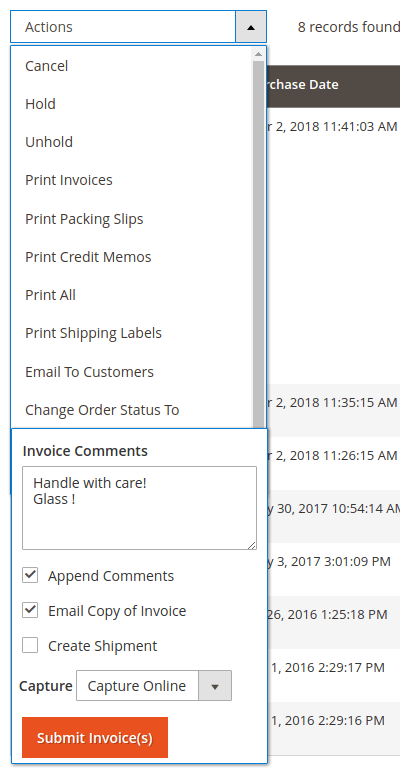 At this point, you can add an Invoice Comment, select some additional functions like Append Comments, Email Copy of Invoice and Create Shipment. 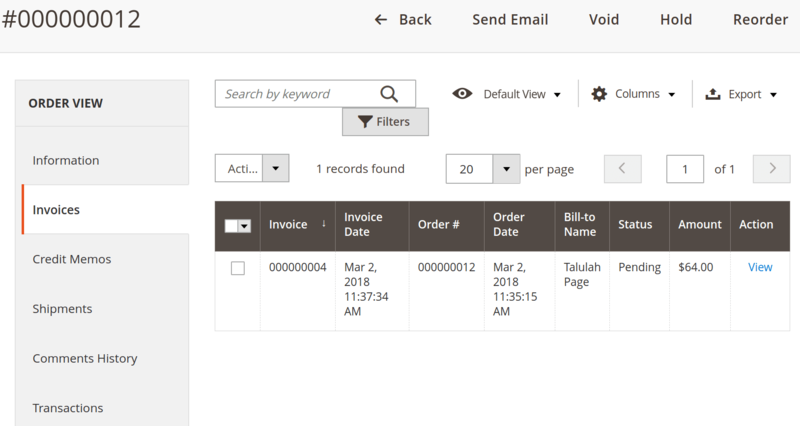 In this example we intend to create only tracking number and invoice, so we tick the first two checkboxes. You can also choose in the Capture field between Capture Online, Capture Offline and Not Capture. After making all the necessary steps, click to Submit Invoice(s). 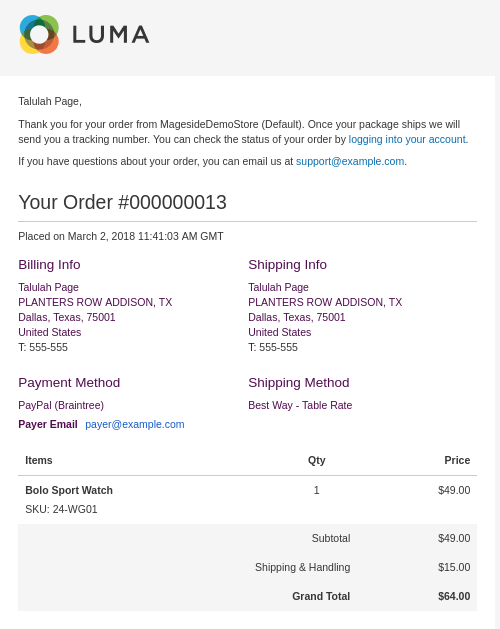 For you to ensure that your actions were correct navigate to the necessary order page and check the Invoice section. 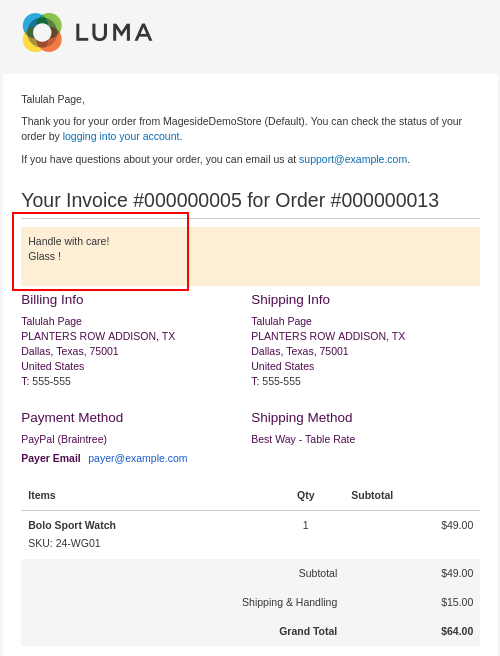 Meanwhile, Talulah Page got her email “Order” (with the comment and number of the invoice) right after creating them. Note: Consider the fact that you are able to process several orders at a time, all you need is to make such manipulations in the order grid to as many orders as you want at a time.